Mill Pond Mercantile — there’s something for everyone at the Mill Pond Mercantile, New London, MN. Northland Arboretum — Recreation. Conservation. Education. Come and Learn! Brainerd, MN. Ralpha Health and Wellness — provider of homeopathic and natural health services in Rogers, MN. I have pretty much made every meal our family has eaten since the conference from your cookbook and I can’t even begin to tell you how pleased and blessed we have been! I have two other people who have bought your cookbook based on my recommendation and have started using it. My sister and I even started a GINORMOUS garden with your book in one hand and starter plants in the other. Your book has really taken our endeavor toward giving our family a healthy start in this poisonous world a whole new level! Cassie D.
So many times on our ‘healthy eating journey’ we have heard, “It’s simple! Just cook like Grandma used to!” And, while that is true- it IS simple to just COOK like Grandma used to. The thing is, Grandma didn’t have to contend with Little Debbie and Caribou! As adults, we know that we should be eating nourishing foods and we know what it takes to BE a nourishing food. But, for parents trying to instill healthy eating in our children, it’s not that easy. The processed foods appear so much more fun and colorful—while “healthy food” has a reputation of being bland and boring (let’s face it, adults might think this, too!) Enter in Farm Girl Fresh! These ladies have each been on ‘healthy eating journeys’ of their own and have shared their wealth of knowledge and recipes in this amazing book! They put the excitement back into healthy eating—by spicing it up for adults (and contending with Caribou in their Pumpkin Chai Latte- with NO artificial ingredients!) and including so many fun snack (and other) ideas for little ones (smoothies, muffins, chocolate syrup…The list is seriously endless! Of course, there are also many recipes for mealtime things– from soups, to sandwiches, to whole chickens, etc.). In the book, they mentor you all the way from planting, caring for, harvesting, and preserving the crops (if you so choose) to preparing it in a way that you won’t even miss the processed version! We have made 1 or more things from this book every day since we’ve had it! – Lindsay B. Our family is absolutely falling in love with this cookbook! I would highly recommend everyone check this book out!! -Whitney C.
I have read this book, every word, from cover to cover, and can easily say this cookbook is my favorite. I love the pictures. I love the authors. I love the message. – Candace B. 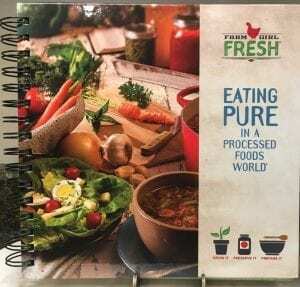 LOVE LOVE LOVE my new Farm Girl Fresh cookbook! It has AMAZING healthy recipes and ideas that your whole family will love. – Annie P.
I LOVE THIS BOOK! It has changed the way we eat. It’s so nice to be able to make meals and have your kids actually eat them. If you haven’t purchased their book already, I highly recommend it. The recipes are practical, family-friendly, and healthy. Thank-you Farm Girl Fresh for taking the stress out of my meal planning! – Rebecca B.